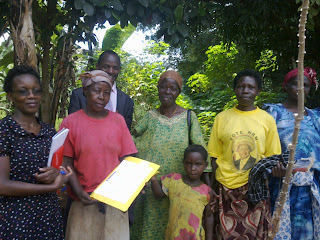 We recently held our CPMT in Masindi District, Western Uganda. The CPMT focused on the Household Mentoring methodologies, implemented by District Livelihoods Support Programme. This is because other projects have been requesting for an opportunity to learn about household mentoring, and had requested that this CPMT be convened for that purpose. Participants included staff from the projects, Ministry of Finance, Planning and Economic Development, Ministry of Agriculture – the Plan for Modernization of Agriculture (PMA) Secretariat, Uganda Cooperative Alliance (UCA), Uganda National Farmers Federation (UNFFE), Uganda National Agro Dealers Association (UNADA), and Masindi District Local Government. For this CPMT, the objectives included; Sharing experiences, lessons learned and impact of House Hold mentoring, discussing opportunities of sustainability and scaling up, as well as providing feedback to projects towards enhanced performance. Over all, the field work was successful and the plenary presentations and discussions were very animated as people shared what they observed in the field, what they learned and what they thought was replicable. We also shared something on project performance in regard to the Project Status Reports and how we can ensure improved rating through effective management and implementation. Sharing experiences and field visit with time to interact with beneficiaries to understand the implementation approach and impacts on ground. Presentations were relevant, and so was the representation of other stakeholders. Here is the CPMT in photos! After being mentored, the lady in the second pic above has now started building a better shelter for herself! are showing off the crops they have been able to plant by working together as a family.